I know, I know; it is April 15 and I am still writing about skiing. I can't help it! Pretty soon, all the snow will be gone and I'll be left with only trail running and cycling and paddling and hiking and swimming and fishing and boating and all the other warm weather activities I force myself to do so I can make it until next ski season. Today's motto is, "Ski it if you got it." And we have tons of snow that should not go to waste! The saints who run Whiteface Mountain have announced the mountain will re-open tomorrow, Wednesday, until the final day of operation which is this Sunday, April 20. Conditions are superb; there is great coverage on most of the trails and the corn skiing has been excellent. The lifts will be running tomorrow through Sunday, so no climbing skins are necessary - yet. I had an incredible two-hour ski last evening at Mount Van Hoevenberg, which is technically closed for the season. I skied until I ran out of gas, since the skiing was so excellent, the sun was shining and there was such great snow cover. 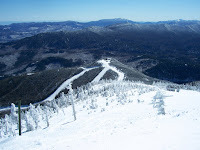 If you like corn snow and sunshine, I heartily suggest you take a few more runs in the Adirondacks this week! !